Further, at levels of around just 6400 rads, about 94% of immature cockroaches will die and at around 10,000 rads, most adult cockroaches will not survive. While this is very impressive by human standards (humans only being able to survive about 400-1000 rads before death), it’s decidedly unimpressive by insect standards; most insects can survive much higher rates than the cockroach, according to the United Nations Scientific Committee on the Effects of Atomic Radiation, who, when they aren’t spending their time trying to spit out their name, apparently enjoy zapping various living things with ionizing radiation. Squeal piggy! So who are the actual living creatures that would inherit the Earth after a world-wide nuclear war? Well, it has been shown that fruit flies take around 64,000 rads to kill. More impressive than that is the flour beetle which can withstand up to around 100,000 rads before dying. Even better is a type of wasp, the Habrobracon, that can survive as high as 180,000 rads! These all get beat by the Deinococcus radiodurans microbe. This bacteria can survive radiation levels as high as 1.5 million rads at room temperature and nearly 3 million rads when frozen, such as during a hypothetical nuclear winter. As you might have inferred from this, this means that if the radiation experienced by these cockroaches was consistent over a long period of time, they are going to be significantly more susceptible to problems than the numbers quoted in this article. The above numbers are using specific bursts of radiation over a short span. 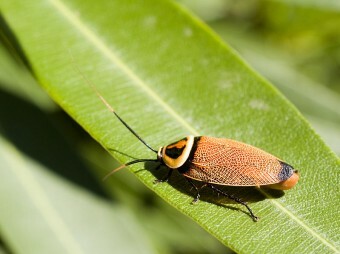 Given that at any given moment about 75% of cockroaches aren’t experiencing cellular dividing, about 75% of them are going to be much less susceptibility to damage from these short bursts of radiation, which will drastically skew the numbers of what the species as a whole could survive when talking about a global nuclear fallout scenario. More accurate research would then have to be done to see what levels of radiation kill or otherwise will significantly harm the roaches that are currently having their cells divide. Further, ionizing radiation is cumulative, so that would have to be factored in as well. The largest nuclear bomb ever detonated was the Tsar Bomba, detonated by the Soviet Union. This bomb was estimated at around 100 megatons of TNT or about just shy of 7000 times more powerful than the nuclear bomb dropped on Hiroshima. The Deinococcus radiodurans microbe was first discovered growing on rotten canned meat that had been sprayed with an ionizing substance meant to preserve it. This microbe had no problems surviving such low levels of radiation. A cell’s increased susceptibility to damage by ionizing radiation when dividing is why humans and other mammals are so susceptible to this radiation, given that we experience cellular dividing all the time. This is also why radiation is effective at such low doses at killing cancer cells, relative to what is required to damage healthy cells. Cancer cells divide much quicker than most other cells in the human body; thus, you can kill the cancer cells faster than the healthy cells and hopefully find a happy medium where all the cancer cells die, but enough of the healthy cells remain and are undamaged enough for the person to continue living on more or less as before. While cockroaches may not be well equipped to survive nuclear fallout, relative to various microbes and most of their insect brethren, these little critters are extremely hardy with fossil records of cockroaches dating all the way back to 300 million B.C., which pre-dates dinosaurs by around 70 million years. Cockroaches have been shown to survive with their heads chopped off for nearly a month. Further, they can survive as much as 45 minutes without oxygen and can survive on very low quality of food, such as the glue on a postage stamp, or cellulose, and very little of this food. They can even survive by simply eating each other, if needs be, which would ultimately doom them if that was their only food source, but works out in the short run. Waterbears are the ultimate survivors. Check it out. The Tsar Bomba that was exploded was 50-58 megatons. It was originally planned for 100 megatons but thankfully even the Soviet’s at the time felt that 100 megatons wasn’t worth it. Ditto. I have read 52 MT and downgraded from 100 MT.